YOU DESERVE TO HAVE POWER. IT IS YOURS FOR THE TAKING. GENE SIMMONS IS HERE TO UNLOCK THE DOORS TO THE TEMPLE. 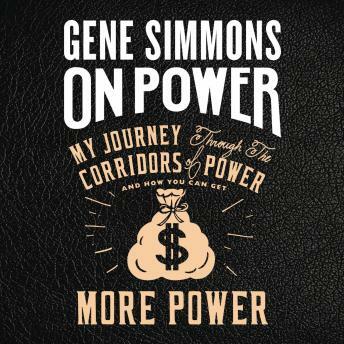 Gene Simmons, KISS front-man, multi-hyphenate entrepreneur, and master of self-invention, shares his philosophy on power—how to attain it, how to keep it, and how to harness it as a driving force in business and in life. As co-founder of KISS, America's #1 gold record-award-winning group of all time, Simmons knows the thrill and seduction of power firsthand. But gold records alone don’t equal power. The decisions you make once you attain a certain level of success are what separate the pretenders from the pantheon. Inspired by Niccolo Machiavelli’s The Prince, Simmons offers his unique take on the dynamics of power in every realm of life, from the bedroom to the boardroom, to the world of rock, celebrity, and social media, to politics. With one-of-a-kind anecdotes from his life and career, as well as stories from historical and contemporary masters of power, including Winston Churchill, Napoleon Bonaparte, Warren Buffett, Michael Jordon, Oprah, and Elon Musk, Simmons crafts a persuasive and provocative theory on how the pursuit of power drives civilization and defines our lives. The rules of power are changing in today’s fast-paced, hyper-connected world in a way that Machiavelli never could have imagined, and we all need to learn to adapt. Simmons tells listeners: Ignore the negatives. Be unrelenting. Rise above the rest. You are the architect of your success.